available CCA vacancies are 60 posts. Only Retired Government Employees are eligible for this recruitment. Preference will be given to the Individuals who are residents of Paschim Bardhaman district. Candidates with eligible criteria need to log on to the district website http://www.bardhaman.nic.in and download the application form. Fill the mandatory details and submit before closing date i.e. 10-11-2017. Walk in Interview will be held by Bardhaman district level selection committee to recruit candidates for Contractual Clerical Assistants vacancies. Place of posting is anywhere in the district of Paschim Bardhaman. Date of Interview will be on 25/November/2017 at 11.00 AM. Monthly Contractual remuneration for CCA vacancies is Rs. 10,000/-. Age of the candidate should be below 62 years. 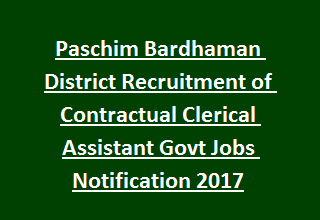 For more details of Paschim Bardhaman District Recruitment Contractual Clerical Assistants vacancy details, Notification dates, Interview details, Age limits, remuneration, Application method are stated below. Total available vacancies in Paschim Bardhaman District Recruitment are 60 posts. Post Name: Contractual Clerical Assistant CCA: 60 posts. Monthly remuneration for CCA Jobs is Rs. 10,000/-. Upper Age limit is 62 years as on date of notification of Walk in Interview. Candidates must have completed Madhyamik or equivalent qualification with computer Knowledge (MS word and Excel). Candidate should be a retired govt employee and preference will be given to those who are residing in the Paschim Bardhaman district. Selection will be made on the basis of candidate performance in the Interview. Walk in Interview will be held by Paschim Bardhaman district level selection committee. Date of walk in Interview will be on 25-11-2017 at 11.00 AM. Interested candidates log on to the district website http://www.bardhaman.nic.in or www.durgapurmunicipalcorporation.org or www.addaonline.in or http://www.asansolmunicipalcorporation.org. Click on the given links and download the application. Complete the filling process and submit to the address given below. Last date for application submission is 10-11-2017.